Summary: Worth the price of admission for its amazing soundtrack alone. It seems weird that only fifty years ago it was illegal for a black person to sit anywhere on a bus in Washington D.C., or to eat in a restaurant that didn’t have a counter designated ‘colored’. But this is the world in which Dewey Hughes (Ejiofor), station director for WOL-AM, has grown up. Dewey has managed, through sheer determination, to leave his childhood in the projects behind, get an education, and a proper job; his brother Milo (Epps), however, was less lucky, and is in prison, and its on a visit to his brother that Dewey first meets Ralph Waldo ‘Petey’ Greene Jr (Cheadle). Petey has already been doing stints as a DJ on prison radio, and he pesters Dewey to give him a job; Dewey doesn’t take him seriously so is appalled when Petey, in full black power outfit and accompanied by his irrepressible girlfriend Vernell (Henson) turns up in reception and demands ‘his’ job. The station has been losing listeners for a while, and though Dewey questions his own judgement, part of him thinks that Petey might just be the breath of fresh air that they need to bring back their audience – Petey’s promise to tell the truth, his frank, honest, funny and sometimes controversial style, is immediately appealing, and despite insulting Motown boss Berry Gordy on air, and swearing, he is given a job. Petey soon becomes an iconic radio personality, playing fantastic soul music and talking directly to his listeners about race and power during this most turbulent of eras. You know awards season is coming when one film after another is suddenly really good; in the last few weeks I’ve seen tonnes of classy, well-made, interesting films and I’m pleased to add Talk To Me to the list. Petey Greene is not a familiar figure but his and Dewey’s story is funny and moving and a rare thing – a film about love and friendship between two men, and a film about the Black Power movement that isn’t a civil rights film per se. 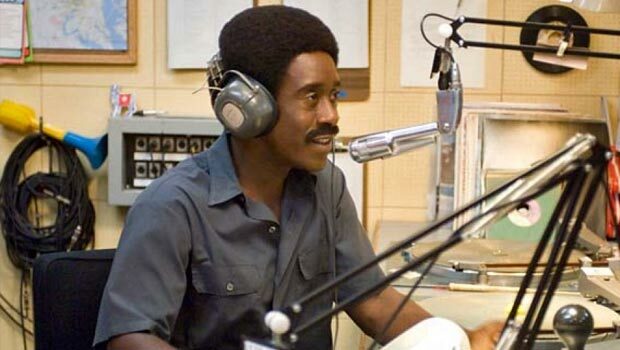 The background is always there – the aftermath of Dr King’s assassination is a key scene – and Petey’s critique of the system is an important theme, but the film is also very funny – Petey’s first on-air appearance being a case in point. The relationship between Petey and Dewey is beautifully played out by the actors, who age over three decades from the 1960s to the early 1990s (fun for the wardrobe department). This is the oddest of odd couples; Dewey in his suits, his manners imitation Ivy League, Petey with his immaculate Afro and his street ways, but the two men recognise something in each other and Dewey earns Petey’s respect. Dewey appears to be a conformist, but once he gets his chance at WOL-AM, his objective is to promote black culture, to give black people a voice, and Petey his chance; Petey in his turn gives Dewey the confidence to become the man he wants to be. Cheadle more than makes up for his appalling performances in the Ocean’s films, while Ejiofor is good as ever. Supporting both of them are the hilarious energetic Taraji P. Henson, Vondie Curtis Hall as the past it DJ who Petey replaces, and Martin Sheen as station owner E. G. Sonderling. I hope it finds an audience; we need more of these stories. Worth the price of admission for its amazing soundtrack alone.